A single line written in a history book sparked a 2 year investigation into the hidden history of the Southern Mpumalanga Region and in particular about the rich history of the Swazis. The Swazi leader Ndlambe gave safe passage to a small clan of Shangaans who had become embroiled in a local dispute. The Shangaan clan resettled somewhere in the Amsterdam area, things went well for a few years and the clan via intermarriage had become "Swazi". Then trouble started brewing when the Shangaan chief's son went to pay labola for the daughter of the Swazi leader. Once the bride price had been paid, the first wife of Ndlambe refused to allow her daughter to marry a shangaan. The cattle were duly driven back to the Shangaan chief's kraal and instead of returning the bride the Shangaan clan proceeded to beat the herd boys and Ndlambe's representatives and took back the cattle. As one can imagine a full impi’s of Swazi warriors, between 300 - 500, was sent to deal with the Shangaans. By the time they arrived at the Shangaans' kraal, they (the Shangaans) had fled in a westerly direction. According to the source of this information this would have happened after the harvest was already in but before the new planting season, effectively June, July or August, the heart of the winter months. The impi’s followed the clan and 3-4 days later, after passing through an area of many lakes (Chrissiesmeer? ), they reached an area dominated by a flat topped hill with gently rolling grasslands and not a tree in sight. Then disaster struck in the form of the mother of all snowstorms. 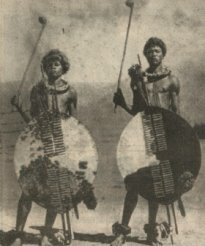 The scantily dresses impi’s tried to run out of the snowstorm but when the snow reached calf-depth they were instructed to gather grass for fires but grass burns very quickly and within an hour the induna instructed them to clear a circular area and crouch down with shields over their heads and on the sides, and still the snow fell. The imps with shields covering them would have looked like a tortoise, but this covering was to no avail as the weight of the snow caused the covering of shields to collapse onto the warriors underneath. With temperatures way below freezing, very few of the warriors survived that terrible snowstorm. The older Swazis, who can remember, recall a place near the present Ermelo that was given the name "Hloniphani" a place of respect. What happened to the Shangaan clan is anyone's guess but this story may have its base in a real historical happening. Rural legend, fact or fiction, we may never know, but this goes to show we have a deep hidden history in this area.